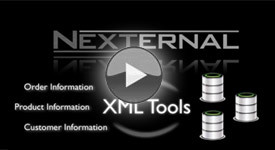 The Nexternal eCommerce Platform offers XML Tools designed to allow data synchronization and integration with third party systems housing similar data. All Tools involve server-to-server communication whereby the initiating server sends a Request XML document to the appropriate URL, then receives a Reply XML document from Nexternal, then parses that document and takes appropriate action to achieve the desired integration. OrderQuery allows merchants to "export" all order information including customer and line item data. OrderCalculate allows merchants to retrieve information about the possible shipping rates and methods,discounts and taxes, and the current inventory levels for each line item in an order. OrderCreate enables merchants to push order data into Nexternal from third party systems. This is useful in many scenarios. For example, if a company moves to Nexternal from a different system and wants to keep historical order data or if a merchant uses a third party call center and wants to push data from their software into Nexternal's system. OrderUpdate is used to update Order and Line Item Statuses including importing tracking numbers. CustomerQuery contains all customer information including custom field and additional address information. CustomerUpdate is used to update and add customer information including multiple addresses and preferred credit cards. ProductQuery allows merchants to "export" all information specific to products. ProductUpdate allows merchants to add and update product information. InventoryUpdate allows the merchant's Nexternal system to receive inventory information from another system. Inventory could also be updated via the ProductUpdate, however, this tool is much simpler if the only goal is to update inventory levels. SavedCart query completes the suite and will return information about customers who have placed items in their Shopping Carts, but have not yet completed the checkout process (abandoned carts). One powerful security aspect of the tools is that clients can setup XML Specific Users and control the permissions to each tool at the user level. For example, a company might have one user that only has ProductQuery access and a totally different user that has the ability to run OrderQuery and OrderUpdate. Objects that are updated or created via an xml specific user profile are denoted as such. Successful use of the XML Tools requires considerable expertise in XML and the Nexternal Order Management System, as well as the necessary technology assets (i.e. hardware, software, internet service, etc). If you don't have the resources in-house to perform such an integration, please see our Integrators Partner Page.